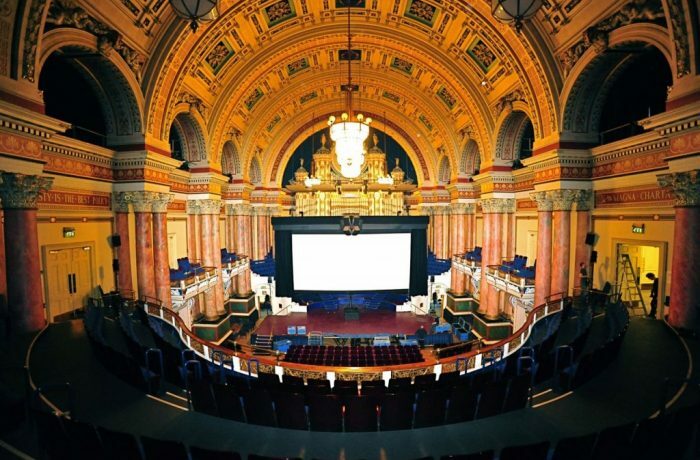 In 2013 Pro Audio Systems were once again engaged to deliver the immersive audio technology that plays such a pivotal role in the festival’s main venue, the historic Leeds Town Hall. As in previous years the company deployed their proven system design which relies wholly on Meyer Sound components – a pair of UPA-2Ps for main L&R plus a UPA-1 for the centre channel, two 700HP subwoofers in a cardioid pattern and eight UPM-1Ps for the L&R surround channels. The very large balcony requires its own supplementary flown system which utilised two UPA-2Ps and a single UPA-1 for its L/R/C reinforcement, plus a further six UPM-1Ps for the surround channels. The 2013 event is the 27th Leeds International Film Festival. Started in 1987 by a small team of volunteers at the Hyde Park Picture House, Chris Fell describes its main aim as, ‘To share the best of new world cinema with as big an audience as possible. We’re not an industry festival, in that we’re not here for the film industry as such – as part of Leeds City Council our remit is to present events for the public and show them the huge diversity of world culture. This has always been our primary goal, and it is what our audiences want, because they are looking for alternatives to mainstream cinema. The majority of the films shown during the festival will not have been seen here before, and in most cases cannot be seen anywhere else in the UK’. How are films chosen? Chris again: ‘We compile the programme in two main ways. Firstly we receive around 2,100 feature films, documentaries and ‘shorts’ from film makers in over 60 countries in the submission period between January and August, and every one is reviewed by our team. Secondly, we seek material by proactively researching the world film market, but the goal is the same – bringing people films they mostly could only see here’. The festival programme is very diverse and comprises includes five main sections – ‘Official Selection’, ‘Retrospectives’, ‘Fanomenon’, ‘Cinema Versa’ and ‘Short Film City’. ‘Retrospectives’ is a great example of how the festival is structured to achieve its stated aims, as it includes around 30 classic movies chosen mainly because they’re well known but haven’t been screened anywhere like the Town Hall before (this year including the 1949 Carol Reed British film noir classic ‘The Third Man’ – imagine seeing that in an atmospheric setting like a magnificent Victorian building!). Even more unusually, the same programme this year includes a season of films by Japanese film maker Masaki Kobayashi – Chris says, ‘His films are hardly ever shown in cinemas outside of Japan and you can’t really get them on Blu-Ray or DVD either. We’ve imported them ourselves, with some assistive funding from the Japan Foundation, so it’s really a unique opportunity for people here to see his work’. The sheer scale of the festival is now very impressive. Across two weeks some 35,000 film-goers will watch over 300 films with the Town Hall being the most popular venue. Although the purpose of the festival is resolutely non-mainstream, the programme does include some broad-appeal, Hollywood films, but even these are chosen with care…Chris again: ‘We opened with ‘Gravity’ (2013, directed by Alfonso Cuarón) this year, which is technically mainstream but really it’s quite experimental, a genuinely interesting and big-risk idea – when we choose mainstream films we only choose those that are a bit different. Another example is ‘All Is Lost’ (2013, directed by JC Chandor), which stars Robert Redford as a sailor lost at sea and which features almost no dialogue – in fact it’s been described as ‘Gravity’ at sea. Its reviews were as good as those ‘Gravity’ but what attracts us is that it takes some risks’. Paradoxically the audio infrastructure in the Town Hall has to be toned-down somewhat for some of the classic movies. Obviously the makers of films in the 40s and 50s had no way of knowing what 21st century audio technology might be able to do for them, but more relevantly the audiences who enjoy those movies in that extraordinary setting won’t be expecting (or wanting) super high-definition multi-channel audio. Fortunately achieving this is relatively straightforward for the audio technicians. One classic that does benefit from the modern technology is Stanley Kubrick’s 1968 masterpiece ‘2001:A Space Odyssey’, which returns to LIFF 2013 due to popular demand, having been part of the 2012 programme. Chris says of the film’s soundtrack, ‘The films that get audiences excited here (in the Town Hall) tend to be those with great soundtracks. ‘2001..’ is amazing because there’s relatively little dialogue but lots of wonderful classical music and it just sounds superb here’. ‘For example, five years ago we started using the Town Hall as our main venue, and this year the Everyman Cinema has become part of the festival. Perhaps in the future there might be a great outdoor space we could use, or see more cinemas built, or perhaps a new multi-arts venue, who knows? The key for us is to keep adapting to the changes and new opportunities that Leeds is delivering’. Pro Audio Systems wishes to express its gratitude to Chris Fell for assisting us in the production of this article.